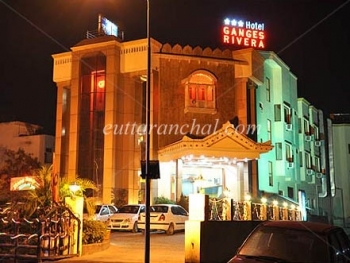 Hotel Ganges Rivera is a 3 Star hotel in Haridwar which is proficient in providing luxurious and comfortable stay. It is considered as one of the best hotels in Haridwar. Strategically located on the banks of the sacred Ganga River, Hotel Ganges Rivera offers impressive views besides great service. The check in and checkout time of the hotel is 12 noon. The staff at the hotel is friendly and they serve the guests with warm hospitality, supreme service and convenience. Hotel Ganges Rivera is an ideal place stay for business travelers, adventurers, nature lovers and devotees. The hotel houses a conference hall for business travelers and restaurant for foodies. Hotel Ganges Rivera facilitates its guests with world class amenities. Hotel Ganges RIVERA is located Opp. to the holy bank of River Ganga, by pass road Haridwar. Two and a half kms. from famous Har-Ki-Paudi and Mansa Devi Temple. Just 1 km from Railway Station and Bus Stand. Hotel Ganges Rivera provides luxurious accommodation with a different range of rooms so as to meet the needs of discerning travelers. Rooms in Hotel Ganges Rivera are categorized as Couples Dream, Family Rivera, Executive Rivera, Royal Rivera and Deluxe Rivera. All the 36 rooms are stylishly furnished, spacious and well equipped with modern amenities. The rooms are designed in the traditional ethnic style with a modern touch offering visual treat and a comfortable stay. Rooms are equipped with satellite television, radio, direct dial telephone, hair dryer and a luxurious washroom. All rooms receive plenty of sunlight while some rooms overlook the sacred Ganga River. The efficient staff of Hotel Ganges Rivers provides with 24 hour room service. Rivera Rasoi is the multi-cuisine restaurant of Hotel Ganges Rivera. Delicacies of North Indian, Continental, Garhwali and Chinese cuisines are served at Rivera Rasoi. Superior quality raw materials are used to ensure quality food offered. The restaurant is spacious with royal interiors that will give you a kingly feeling. Take a holy dip in the sacred Ganga River. Visit nearby popular temple like Chandi Devi and Mansa Devi. Don’t miss the evening aarti at Har-ki-Pauri. Plan short excursions to Rishikesh and Neelkanth Mahadev. Hotel Ganges Rivera also organizes transportation to popular places like Rajaji National Park, Rishikesh, Char Dham Yatra, Auli, Nainital and Mussoorie. Check your mails at the cybercafé of the hotel. Conference hall is well maintained by the hotel for business travelers. Indulge yourself in the delicious food served at the Rivera Rasoi. Air : Jollygrant airport in Dehradun is 35 kms. from Haridwar. Rail : This major pilgrimage center has been well connected by trains to all the major towns of India. Haridwar Railway station is 1 Km from Hotel Ganges Rivera.